According to tradition is a spirit of a dead person that visits the living. Most people do not believe in ghosts, but some do. 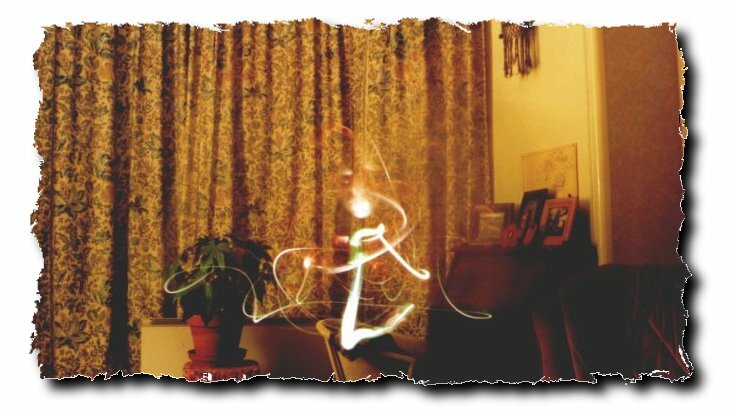 Reports of seeing or hearing ghosts have been common throughout history--more so in ancient and midevil times than today. There have been many stories, books, motion pictures and plays about ghosts. In most stories and reports about ghosts, the ghost resembles it's living form. Many ghosts are transparent or shadowdy.Some ghosts are pictured as white sheets shaped somewhat like a body. Many ghosts are malevolent.That is, they try to do harm. Some ghosts are friendly. A malevolentghost is usally the spirit of a person who was murdered or otherwise harmed by relitives or friends.Such ghosts may try to revel who murdered it-- as in William Shakespeare's play Hamlet--or try to frighten the murderer--as in Shakespeare's MacBeth. Most malevolent ghosts haunt the place where, in thier real form they died or were buried. A ghosts that haunts a place by making strange noises, and caused doors, furniture and other objects to move by themselves is somestimes called a poltergeist. Friendly ghosts include Marley in "Charles Dickens" A Christmas Carol. Marley helps Ebenezer Scrooge, the main character become a better person. Ghosts play an important role in some religions. Many Americian Indians and tribes people in Africa and the Pacific Islands believe in spirits that infulence the living world. They perform rites to please the spirits in order to assure sucuss. Many people fear the dead and observe special funeral customs to make sure that ghosts do not return. At aliennation51 we enjoy your pictures and stories. If you have any, send them to connors_world@hotmail.com and the best of them we shall put onto the site. Please include your name, age and E-mail adress and we shall get back to you.